Wait, So There's an Actual Hobbit House in Culver City? 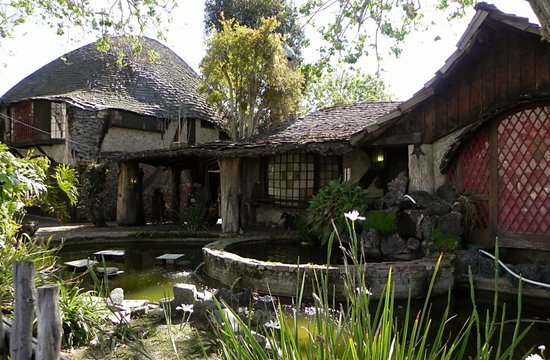 Wait, So There’s an Actual Hobbit House in Culver City? Storybook homes (like homes literally built from pure inspiration of fairy tales and such) were quite common place in early 20th century Los Angeles. However by the 1930’s construction on these type of residences had essentially stopped, and fewer and fewer survived the development of the city over the next 80 years. Nestled away just a stone’s throw from Sony Studios, The Hobbit House, as it’s affectionately known, is one such residence (actually a set of apartments) that has been preserved to present day, and remains a quirky drive-by photo opportunity for tourists and locals who are willing to swing by the Culver City area to have a look. In 1996 it was even declared Historic Cultural Monument #624 in the city of Los Angeles. Frankly, we think that’s pretty cool, especially if you’re into visiting The Shire (sort of). – Did we mention Hobbit House? This is private property, so you can’t just go traipsing all over the place without consent, but at least according to one Yelp reviewer a resident was kind enough to allow them into the yard to snap a few photos. Proceed with caution and consideration! So Where is the Hobbit House?